Serge Mouangue and T-Michael are two different designers from two different countries on two different continents. But the pair share a love and respect for Japanese kimono; so much, that they interpret it into their designs. We took a look at their creations, and discovered a new meaning for same difference. “I discovered that the way Japanese and West Africans socialize is very similar,” the designer Serge Mouangue said in an interview. Born in Yaounde, Cameroon, Mouangue found out that Japanese and West Africans share more than a few things in common, in terms of tradition. That’s how the idea of combining aesthetics from both cultures came to mind, and Wafrica, which he refers to as “a third aesthetic,” was born. The name itself is derived from “Wa,” which is Japanese word for “spirit,” and Africa. 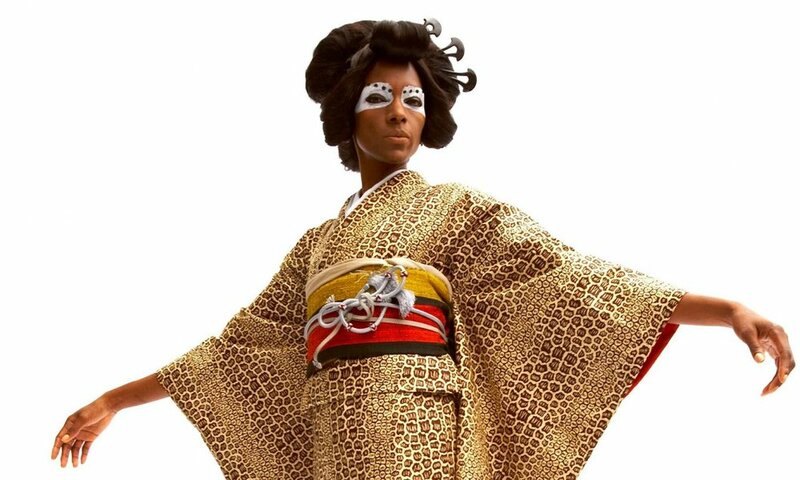 Under the Wafrica brand, Mouangue, who studied Art, Design and Architecture in Paris, has produced sculptures, live performances and a clothing line combining Japanese and African elements. The line is made up of traditional kimonos, made from West African textiles. Each garment follows the shape and line of a woman’s kimono, but with the vibrant colors and patterns of an African fabric. All designed by Mouangue, the patterns tell West African stories and fairy tales. A sketch he made, for example, tells a West African tale of a woman crossing the desert with her magical animals. In keeping with the finest traditions, Mouangue is now collaborating with Odasho, one of the most respected Japanese kimono makers - founded 150 years ago. Made for young men and toned-down in every aspect, T-Kimono presents an adapted version of Japanese kimono. While Wafrica is Africa-infused, T-Kimono is Scandinavian-influenced. A collaboration between Norwegian tailor/designer T-Michael and Japanese clothing company Y. & Sons, T-Kimono fuses Scandinavian minimalism into the kimono’s silhouette. T-Michael became interested in Y. & Sons’ approach to men's tailoring during one of his trips to Tokyo - the feeling was mutual. Three years later, T-Kimono was born. The collaboration works like this: T-Michael designs the wool flannel cloth, which is woven at a mill outside Barcelona, before shipping it off to an artisan studio in Niigata, Japan, where Y. & Sons hand tailors the kimonos. The result is a wool kimono in two muted colors - blue and gray -draping the body like a Western-style suit would. The outfit comprises two pieces, namely the Haori (the jacket) and the Kimono (the suit). T-Kimono will be available at Y. & Sons starting October 2017, but it’s already available to order at T-Michael’s website. Images c/o Wafrica and T-Michael.